There is a woeful lack of critical thinking in the world in general and the nation and church in particular. Notice that I didn’t say there was lack of knowledge. As we all know, we live in an age where there is an abundance of information wherever you turn. You don’t even have to turn around, just turn on your computer. If you don’t have a college education or even a library card, all you need is the Internet. So then, what do we do with the information that we have? Notice that the word critical in the first sentence of this article is closely associated with the word critique. To critique something means to compare it to an established pattern. That pattern can be about conduct, shape or size. What is our pattern as believers? The apostle Paul was blessed with deep and penetrating insights into the things of God. He was renowned throughout the region as a great writer and communicator of the gospel of Christ. The Bible also speaks of the Bereans. These Bereans, however, were a group of believers who did not even accept what Paul said just because it was Paul who said it. They examined what he asserted by comparing it to Scripture. They said, in essence, “that was great Paul, thanks for coming, but we need to double-check this.” How did Paul respond to this? He called them noble! (Acts 17:11) He also emphasized the point further when he said, “Be ye followers of me, even as I also am of Christ.” (1 Corinthians 11:1) This is a lesson that is lost to many of us. Too many Christians have a propensity to look down their noses at individuals in other denominations as “my bishop says,” “my pastor says,” “my reverend says,” or even “my priest says,” types of people. Unfortunately, many of us are quickly acquiring the same type of mentality. More and more of us are hiding behind the words of our ministers to mask our own lack of understanding. We feel and believe that because we have “the truth” we can safely ‘cruise’ as individuals. We accept, uncritically, whatever comes from the pulpit, the quarterly, and the top leaders. Truth, however, does not originate in any of these places. These three examples should be conduits of the truth but not the source of it. God says, “my doctrine shall drop as the rain, my speech shall distil as the dew.” (Deuteronomy 32:2) This is the standard for truth and doctrine. What God says is truth. 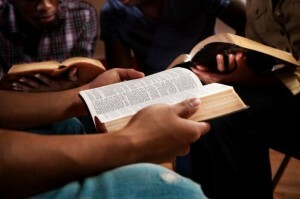 “Thy word is truth.” (John 17:17) Too often, we are mentally and spiritually lazy and we fall into a snare. Christ warned, “If the blind lead the blind, both shall fall into the ditch.” (Matthew 15:14) Critical thinking needs to be employed when it comes to weighing what God’s word says to each of us. No one renders a verdict in a court of law without being privy to the evidence. That is the responsibility of being a juror. And no one sits on a jury and then allows someone outside of the jury to form the verdict. We are to be a jury of one where our spiritual understanding is concerned. God will not ask any of us in the day of judgment if we believed what our pastors, mothers, fathers, brothers, sisters, uncles or aunts believed. He will ask us how we weighed the truth that was available to us. If someone were to ask you what you wanted to eat at a restaurant, would you leave that decision in the hands of another? Is your salvation less important than satisfying your appetite? So, in a nutshell, what do I hope to leave with you after reading this article? Learn to make your decisions based on the weight of evidence, and what you understand for yourself. Learn to be honest about what information and evidence you really have a grasp of before you make any decision. This is not a license to sin. An uninformed choice is as bad as letting someone else decide for you. Go to God, get informed, pray earnestly, and then make an honest decision from your heart and mind. This is a principle that needs to permeate our lives in politics, in dress, in diet, in behavior, and most importantly, in matters of the spirit and the conscience. Be a Berean! May God bless you. In my own studies, I find that the Bible emphatically repeats important points so that crucial doctrines are reinforced. Nothing important to the faith should be established on a foundation of only one verse but by the “witness” of at least two or three verses. “At the mouth of two witnesses, or three witnesses, shall he that is worthy of death be put to death; but at the mouth of one witness he shall not be put to death.” (Deu 17:6) ALL Christians need to understand why they believe what they believe, and “because my church or pastor or denomination teaches it” is NOT a good-enough reason! Does the Word of God teach it? ARE YOU SURE IT DOES??? Excellent comment, Sister Rebecca. Thank you so much for sharing. Studying the Bible for yourself is critical, especially the closer we come to the end of time when false teachers are so aggressive that they will deceive, if possible, the very elect (Matthew 24:24).